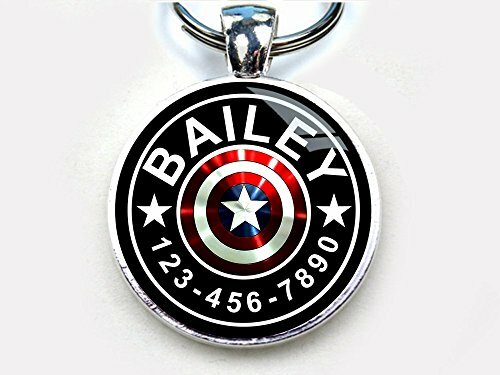 *Free Customized with your pet info such as pet name and phone number. *Please include the info you want to show on the tag in the GIFT MESSAGE section when checking out. *The tag is single sided and the back side CANNOT be engraved. I can only put name and phone number on the front side. *Sealed and encased inside the industrial grade resin to protect the graphic and pet info from outside elements. *The tag has unique image and design with brilliant color. and it is very light weight! Free Customized with your pet info such as pet name and phone number. Please include the info you want to show on the tag in the GIFT MESSAGE section when checking out. The tag is single sided and the back side CANNOT be engraved. I can only put name and phone number on the front side. The tag has unique image and design with brilliant color. and it is very light weight! Each tag is sealed with high quality resin. Your pet info along with the graphic will be protected from outside elements. If you have any questions about this product by Pet Tags, contact us by completing and submitting the form below. If you are looking for a specif part number, please include it with your message.